The dry edible bean season started out positively with good planting conditions at the end of May and beginning of June. There was not much rain in the last half of May, and by May 28th temperatures were reaching 30˚C with no risk of frost. A large proportion of the dry beans were planted in the first two weeks of June. Some localized rainfall delayed planting to later in the month, particularly for cranberry beans that are often planted last because they mature faster. Dry bean stands looked good early in the season, and the lack of heavy rain in June limited issues with crusting and other rainfall-related plant losses. There were some areas where the seedbed conditions were overly dry. Conditions continued to be relatively dry through to mid-July. Much of the crop looked very promising through the first half of the season. In areas where it was dry the flowering period was stretched out and maturity was somewhat uneven. But dry beans perform best when it is not too wet, and overall producers were optimistic into August. Rains through August may have caused re-flowering, and as rain continued through September and into October the opportunity for a timely harvest was limited. Overall, fewer acres of dry beans were planted in 2018 than in the previous year. White bean acres under production insurance totaled nearly 48,000 acres in 2018, compared to nearly 60,000 acres in 2017. Black bean acreage dropped slightly compared to 2017 with approximately 11,800 acres planted, and kidney bean acreage held steady at just under 14,000 acres. There was a modest increase in cranberry bean acreage; approximately 13,300 acres were planted this year. In the “Japan/other” category under production insurance, which primarily accounts for otebo beans, there were approximately 7,000 acres insured compared to nearly 9,000 in 2017. Adzuki beans saw the biggest increase in acreage and were planted on approximately 13,300 acres in 2018 compared to 7,800 acres in 2017. The total acres of dry beans under production insurance in 2018 was approximately 107,200 acres, down from about 115,800 acres the previous year. Potato leafhopper were present in many regions and reached the threshold for insecticide application in many fields during vegetative growth stages. Tarnished plant bug (TPB) and stink bugs were present relatively earlier, prior to development of bean pods. Both have piercing and sucking mouthparts and inject digestive enzymes into plant tissue. 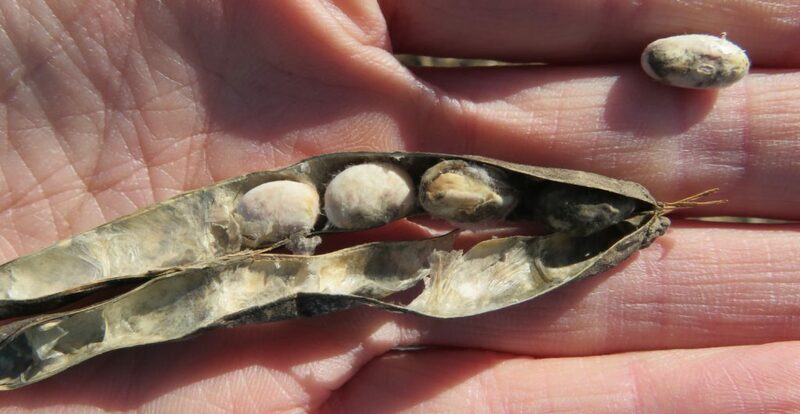 When they feed on pods it can cause dimpling or shriveling of the seeds, increasing pick counts and providing an opening for diseases to enter (Figure 1). Many fields were sprayed for TPB and stink bug this season to protect crop quality. Figure 1. Example of shriveled seed, likely caused by stink bug. 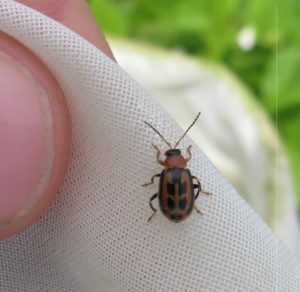 Defoliating insects including bean leaf beetle and redheaded flea beetle were also found feeding in many dry bean fields this season, but typically at levels below threshold. 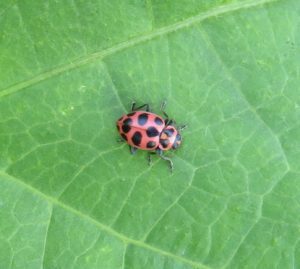 Bean leaf beetle are sometimes confused for the beneficial pink spotted lady beetle, so ensure you are accurately identifying insects and spraying only when thresholds are met to mitigate negative impacts to beneficial insects (Figure 2) and (Figure 3). Figures 2. & 3. Comparison of the defoliating insect pest bean leaf beetle (left, on netting) and the beneficial pink spotted lady beetle (right, on leaf). Levels of western bean cutworm (WBC) were lower overall this season in Ontario compared to last season, particularly in corn fields and in areas that were previously known to be hot spots such as Bothwell in Chatham-Kent, and Haldimand and Norfolk. However, the average trap count of WBC in dry bean fields specifically was higher than last year. This is likely because WBC are attracted to bean fields when corn is beyond their favoured crop growth stage (tassels emerged), and much of the corn tasseled prior to peak moth flight. A combination of trap counts, and crop growth stage are used to decide when to spray for WBC in dry beans. Peak WBC flight varies across regions and between years, so bean growers should monitor traps on their own fields. Fields with traps that capture more than 150 moths are more likely to see economic damage, especially if adjacent corn fields have reached threshold. These fields should be monitored closely as pod development approaches. Dry beans must have pods on the plant for WBC control to be warranted and effective as they only encounter insecticide when they feed on pods. In addition, insecticides should not be applied until after peak moth capture in WBC traps. Spraying should occur 10 to 20 days after the number of moths in traps reaches its peak. You can find information on traps in your region, as well as additional information about WBC, at https://www.cornpest.ca/wbc-trap-network/ and www.fieldcropnews.com. This year there was more WBC activity in Oxford County through to Bruce County, and the average peak flight occurred between July 30 and August 5 – a week later than years past. It is difficult to determine the impact WBC had on bean quality this year because quality has been negatively impacted by other weather-related factors. There was an increase in the abundance of natural enemies of WBC this year. This may have helped reduce the overall impact of this pest in both corn and dry beans in 2018. Some producers are reporting an increase in bacterial disease symptoms over recent years and there is evidence that common bacterial blight (CBB) is not the only causal pathogen. Several white bean varieties carry resistance to CBB. Popular coloured bean varieties do not carry resistance to CBB but use of Idaho-grown seed significantly reduces or eliminates the chance of CBB arriving on the seed. Results of testing over the past two years has shown that many fields showing bacterial symptoms are infected with bacterial brown spot (BBS). BBS has been observed in adzuki beans in years past but is now also showing up on other classes of dry beans. Fungicides are not effective at controlling bacterial diseases, and copper-based products do little to mitigate symptoms, even with repeated applications. There are currently no varieties with resistance to BBS. Consult www.GoBeans.ca for information on varieties carrying CBB resistance. Dry beans are highly susceptible to white mould, so preventative fungicide applications are commonly applied during early flower to pin-pod stages. July was relatively dry and hot in most areas, which is not ideal for white mould development so producers may have decided not to spray additional applications of fungicide. However, there was more moisture in August during later flowering stages and low to moderate levels of white mould were observed. Producers may have also applied preventive fungicide products for anthracnose control. Anthracnose infection did not appear to be a significant issue this season. Harvest was delayed on most acres because of wet conditions in September and October. What appeared to be a relatively high yielding crop sat out in the rain for several weeks. In some cases, the dry beans had already been desiccated and therefore did not stand up well to rain falling day after day. Fields that were ready to be harvested in mid to late September were not combined until the middle of October. As a result, quality suffered (Figure 3). Some producers have reported that rain delays lasting up to 3 weeks resulted in pick counts ranging from 10% to 22% in white beans. Fungus that thrive in wet conditions and live off decaying material, such as alternaria, caused discolouration of beans and reduced the quality where harvest was delayed. Figure 4. Harvest of these white beans was delayed by 3 weeks after desiccation because of rain, resulting in fungal growth and poor quality. Many fields were harvested during a window in the middle of October, but opportunities to harvest since then have been limited. At the end of November there were still some beans out in the field. At the time of this report, less than one third of final yields have been reported to Agricorp. It is expected that yields have been average to above average in many areas, but the low quality of the crop will impact profits.